Boss Antonio Conte says Chelsea's form is being "forgotten" because of Manchester City's record-breaking run, after the Blues beat Southampton to make it eight wins in 10 Premier League games. 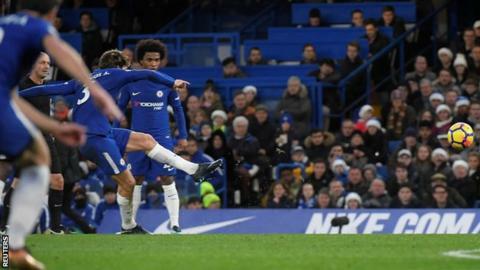 Marcos Alonso's winner sent Chelsea level on points with second-placed Manchester United, who boast a better goal difference and face West Brom on Sunday. But both sides are 14 points adrift of City after the leaders recorded their 16th consecutive win with victory over Tottenham. "Someone is forgetting this run, because there is a team winning every game," said Conte. "I want to remember that in the last 10 games, we won eight games, drew only one game against Liverpool away and lost only one game, at West Ham. "If someone asks me if I want to sign for this in the next 10 games, I'm ready." Alonso's long-range free-kick beat Saints goalkeeper Fraser Forster to put Chelsea ahead in stoppage-time of a first half the hosts had dominated. Eden Hazard thought he had doubled the Blues' lead after the break, but Cesc Fabregas was flagged offside in the build-up. Pedro hit the post and Fabregas shot wide as Southampton, now winless in five matches, rode their luck at Stamford Bridge. Conte said his expectation was "to suffer" before Saturday's game, but his side were in complete control throughout. They should have been in front long before Alonso's speculative, curling free-kick from distance that caught Forster out low to his right. Willian, Hazard and Pedro impressed with intricate passing and neat footwork - but with forward Hazard dropping off when marshalled by a deep-lying Southampton back five, Chelsea were lacking a cutting edge and focal point in the area. Conte opted to keep striker Michy Batshuayi on the bench, while top scorer Alvaro Morata - who has been watching videos of club legend Didier Drogba's goals for the Blues - was only deemed fit enough to also sit among the substitutes. Chelsea's club record signing was given the final 17 minutes to prove he was up to speed in an attempt to put the game beyond Southampton - and he very nearly did with a smart turn and strike soon after coming on. The Spaniard combined with compatriot and fellow substitute Fabregas for the latter to force another save from Forster late on. It was Fabregas who teed up Hazard for the Belgium forward's only shot on goal, which found the net but was ruled out for offside. Southampton are now without a win in five games since beating Everton in November, although during that run they have been narrowly beaten by runaway leaders Manchester City and conceded a late equaliser against Arsenal. It was a much more disciplined performance than Wednesday's 4-1 drubbing by Leicester, and they frustrated champions Chelsea until the third minute of injury time in the first half. Boss Mauricio Pellegrino made six changes, with defender Virgil van Dijk, long linked with a move away from the club, one of those to drop to the bench. Pellegrino said Van Dijk remained an "important" part of his plans, but could not guarantee the Netherlands international would stay at the club in January. "I can't control the market," he added. "I'm not the owner of the player. I can have my opinion and this I have given to the technical director, to the chairman. "After, the board can decide altogether which is the best for the team." Charlie Austin - with two goals in three games prior to Saturday's defeat - was another to find himself left out, but it was the striker's arrival on the hour mark that seemed to offer Saints their most likely route back into the match. He forced a save from Thibaut Courtois with his first touch and managed Southampton's only other shot on target, though Chelsea were never really troubled. Southampton are now just three points above the relegation zone, with the visit of Huddersfield next Saturday taking on added importance before tricky trips to Tottenham on 26 December and Manchester United four days later. Marcos Alonso was Chelsea's most dangerous outlet. Repeatedly finding himself in attacking areas, the wing back scored the winner and had more shots on goal than any of his team-mates, three of which were on target. Chelsea boss Antonio Conte: "When you do not score the second goal, you have to suffer. You are afraid at every corner and free-kick and the opponent has the chance to draw. "We dominated the game, shooting 24 times and hitting the post, and we needed to score the second goal to be relaxed. If you shoot only twice and score two goals, you must be worried. We had lots of shots but we must be more accurate in our finishing. "In the past 10 games, we have won eight, drawn one and lost one. This is our run, you have to consider the last 10 games, not just two. It shows we are doing our job." Southampton manager Mauricio Pellegrino: "It was a difficult game - especially in the second half we suffered a lot. When you play with five defenders, you do not have a lot of people in the middle and they managed the ball more. "The quality of the goal was good, but maybe we can learn more from there. It is not easy to have many chances against Chelsea. We had three clear chances but could not score. "The team is training well, the mentality is good and we are fighting. We are creating a good atmosphere to try and bounce back from this situation. Football is tight but we have another opportunity next Saturday." Alonso has had a hand in 14 goals for Chelsea (10 goals, four assists) - more than any other Premier League defender. Only striker Morata (49) has attempted more shots in the Premier League for Chelsea this season than Alonso (34). Chelsea have scored seven direct free-kicks under Conte in all competitions, more than any other Premier League side since the start of last season. Southampton have only won two of their 41 away top-flight matches against the reigning champions - they beat Leeds United in March 1970 and Chelsea in October 2015. Southampton have kept one clean sheet in their past 25 Premier League games against the Blues. Chelsea host Bournemouth in the Carabao Cup quarter-finals on Wednesday (19:45 GMT kick-off), before visiting Everton in the Premier League next Saturday (12:30). Southampton welcome Huddersfield in the league on 23 December (15:00). Match ends, Chelsea 1, Southampton 0. Second Half ends, Chelsea 1, Southampton 0. Attempt missed. César Azpilicueta (Chelsea) right footed shot from outside the box misses to the left. Assisted by Cesc Fàbregas following a set piece situation. Willian (Chelsea) wins a free kick on the left wing. Corner, Chelsea. Conceded by Fraser Forster. Attempt saved. Cesc Fàbregas (Chelsea) left footed shot from the centre of the box is saved in the centre of the goal. Assisted by Álvaro Morata. Ryan Bertrand went off injured after Southampton had used all subs. Attempt blocked. Cesc Fàbregas (Chelsea) right footed shot from outside the box is blocked. Assisted by Marcos Alonso. Attempt saved. Tiemoué Bakayoko (Chelsea) header from the centre of the box is saved in the top centre of the goal. Assisted by César Azpilicueta with a cross. Corner, Chelsea. Conceded by Ryan Bertrand. Corner, Chelsea. Conceded by Wesley Hoedt. Offside, Southampton. Fraser Forster tries a through ball, but Charlie Austin is caught offside. Foul by Jack Stephens (Southampton). Attempt blocked. Marcos Alonso (Chelsea) right footed shot from the centre of the box is blocked. Jack Stephens (Southampton) is shown the yellow card. Nathan Redmond (Southampton) is shown the yellow card for a bad foul. Álvaro Morata (Chelsea) wins a free kick on the left wing. Corner, Southampton. Conceded by Gary Cahill. Attempt missed. Charlie Austin (Southampton) right footed shot from the centre of the box is close, but misses to the right. Assisted by Jack Stephens with a cross. Attempt blocked. Álvaro Morata (Chelsea) right footed shot from outside the box is blocked. Assisted by Tiemoué Bakayoko. Attempt missed. Cesc Fàbregas (Chelsea) right footed shot from the left side of the six yard box misses to the right. Assisted by Willian following a set piece situation. Corner, Southampton. Conceded by Tiemoué Bakayoko. Attempt blocked. Wesley Hoedt (Southampton) right footed shot from the centre of the box is blocked. Corner, Southampton. Conceded by Thibaut Courtois. Attempt saved. Charlie Austin (Southampton) right footed shot from the left side of the box is saved in the centre of the goal. Assisted by Sofiane Boufal with a through ball. Attempt missed. Marcos Alonso (Chelsea) header from the centre of the box is close, but misses to the left. Assisted by Victor Moses with a cross. Attempt saved. Álvaro Morata (Chelsea) left footed shot from a difficult angle on the right is saved in the top right corner. Assisted by Cesc Fàbregas. Substitution, Chelsea. Álvaro Morata replaces Eden Hazard.